Megan Scott will join Lawrence University as its new Associate Vice President of Communication this fall, serving as the university’s chief brand manager, storyteller, and spokesperson. Scott earned a bachelor’s degree in English literature from Knox College in 1996 and holds a certificate in publishing from the University of Denver Publishing Institute. She worked in academic publishing for eight years, last serving as marketing manager for the University of Iowa Press, where she coordinated all national and international marketing efforts for 30-35 scholarly books per year. 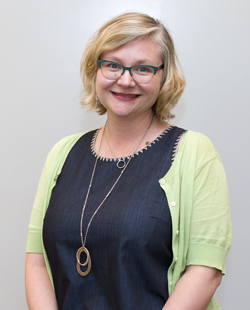 She returned to her alma mater in 2004 to coordinate advancement communications and serve as editor of the Knox Magazine, the college’s biannual alumni magazine. In 2012, she was given the opportunity to lead a newly created Office of Communications at Knox, which was charged with integrating college-wide communications and highlighting Knox’s story to its external and internal constituents. Over the last six years, she and her team have launched an award-winning website, introduced a new suite of admission communications, supported a series of fundraising initiatives, introduced a new internal portal and community newsletter, expanded the college’s visual and social media presence, and helped to launch an award-winning new athletic logo and mascot. Scott’s background and approach made her the ideal candidate to lead Lawrence University’s efforts to ensure that its diverse community of students, faculty, staff, alumni, parents, and neighbors are informed about and engaged with our work together. Scott will serve on the president’s cabinet, working closely with university leadership to perform a job she knows very well. Scott will transition to Lawrence with a couple of shorter visits to campus over a six-week period, starting with Lawrence’s annual matriculation convocation and its first faculty meeting of the year on September 13. She will join the campus community full time on October 29. Scott will be joined in Appleton by her spouse, Brian, a high school Latin and English teacher, and their daughters, Clara (11) and Willa (5).